Katipo with 3 egg sacs, 1967, by Richard Sharell. Te Papa. Having spent my last two postings dealing with butterflies and moths, it’s time to move on to the animals I love the most – spiders! The subject of this posting is the katipo spider (Latrodectus katipo), New Zealand’s only endemic spider known to be dangerous to humans. Katipo is a Maori word meaning ‘night stinger’. 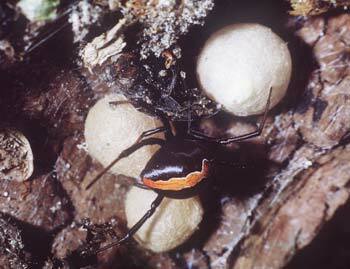 The genus Latrodectus includes a number of species with a nasty reputation such as the black widow of North America and the Australian redback spider. Katipo like sandy beaches (especially dune systems with native vegetation). The range for katipo covers much of the coast of the North Island and extends down as far as Dunedin on the South Island’s eastern side. On the South Island’s west coast they are known from Greymouth north. The female katipo looks is pea-sized and satiny black. Her abdomen is marked with a red stripe on top and a red hourglass below. However, a completely black form of katipo can be found in the northern half of the North Island. Going by the unimaginative common name of black katipo, it has been considered a separate species (Latrodectus atritus) in its own right. However, a recently published study I was involved with found otherwise. I joined forces with Christchurch-based scientists Cor Vink, Adrian Paterson and Jagoba Malumbres-Olarte, fellow Wellingtonian James Griffiths and US-based Pierre Paquin to see just how different the two types of katipo really were. We looked at DNA, body measurements, cross-breeding and more besides only to find no meaningful differences aside from the absence of a red stripe in black katipo females. In short, they are not different enough to warrant being treated as two separate species. Why then do we get the black form of katipo in northern New Zealand? We found a strong correlation between higher annual mean temperature and the presence of black katipo. Darker colouration tends to be associated with a need to absorb more heat, something we wouldn’t expect in the warmer, northern parts of the country. What benefits (if any) the black katipo gets from the loss of her red markings is still a mystery to us but temperature may still have something to do with it. My co-author Adrian Paterson has also blogged about this study and you can read his post here. Amongst other things, Adrian’s post gives more detail on how we evaluated the differences between the two forms. Readers interested in learning more about katipo and other spiders might like to visit the spider section on the Te Papa website. There’ll be more on katipo and its close relatives next post. Reference: Cor J. Vink, Phil J. Sirvid, Jagoba Malumbres-Olarte, James W. Griffiths, Pierre Paquin and Adrian M. Paterson (2008). Species status and conservation issues of New Zealand’s endemic Latrodectus spider species (Araneae : Theridiidae). Invertebrate Systematics 22(6): 589-604.